Cheap balloon modeling balloons – Fancy trying your hand at balloon modeling, these are the balloons the professionals use! 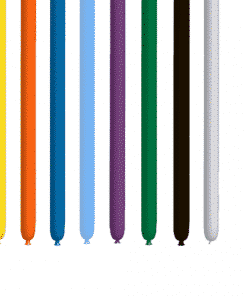 Of the highest quality Qualatex modeling balloons are the number 1 balloons to use for modeling balloon animals, swords, flowers and anything else your balloon creativity can offer. Balloon modeling is a great entertainment at a birthday party, charity events and of course fundraisers. Balloon modeling is just as popular now at grown up parties, where talented balloon modellers can produce some remarkable designs that with a little bit of practice you could too – You tube some balloon modeling techniques and have a go!